Are you a wine lover who dreams of walking through your own vineyard, picturing the harvest and the fine wines it will bring? You may not have to wait until after you retire or spend your life savings on an investment in Europe's finest grapes growing regions. In these areas - where wine grapes grow best and pay the most for their fruits - you'll find little backyard plots converted to mini vineyards. Each of these add their grapes to a co-op or commune that makes the grapes into wine and provides the owners with a growers' discount on the finished product. So if European home gardeners can create and enjoy the fruits of backyard vineyards, why can't the rest of the world? What is changing in the grape industry and in the world of wine is the idea that grapes can only be grown in certain regions. While Bordeaux may be the red wine capital of the world, the competition for the title has just opened to undreamed of regions. There is no state in the United States and no province in Canada that does not support a winery or two...or 200. Even the desert state of Arizona has some prime grape growing areas. Australian wines have been discovered by the world and South American wines are not far behind. The idea that grapes have to be grown in certain areas in Europe to be used to make good wine is fading fast. Using this knowledge, some regular folks have gotten into the growing end of drinking wines. The problem is that grape growing is very hard work. It is, after all, farming. It can also be very expensive. According to an article in Forbes Magazine. "To buy a winery in Napa will run to $13 million or so. One in an emerging wine area such as New York's Long Island will still be millions. In Ohio and Missouri you can even get a tax break to start a vineyard." But you don't have to buy a winery or plant acres of grape vines. The small plots in backyards in Europe have inspired many would be grape growers. The same article in Forbes says that since 1999 one firm, Post & Trellis, "has planted 100 vineyards ranging in size from an eighth of an acre to 3 acres in the area between San Francisco and Silicon Valley." Backyard grape growers in countries outside of Europe have been around for decades. Barb Vetter and her husband Jim have a vineyard in their Portola Valley, California backyard. Members of a group in California, Home Winemakers and Grape Growers, not only grow backyard grapes, they've formed their own group to make it into wine. David Stare of Dry Creek Winery got his start in a backyard in Maryland. "I got to know a Baltimore Sun editor who owned a small winery and vineyard. I would go to his place on Saturday afternoons and taste wines out of barrels. Soon I was hooked on the subject, and I ended up planting 40 grapevines in my backyard," he says. What do you need to grow wine grapes? All you need for a home vineyard is a bit of land, and inspiration. Start out with a vine (or two) and get ready for a real commitment! Grape vines are hardy and will last anywhere from 50 to 100 years old. After the initial planting, grape vines will be off and running the first year, but it usually takes about three years for new vines to be hardy enough to bear fruit. • To start, get the land ready in the fall for planting in the spring. Generally, grape plants don't like soggy roots, so you'll need to add sand, gravel, or peat moss (if necessary) so that the soil is well-drained. Since grape vines are usually not heavy feeders, there's no need to overly-fertilize the soil. as grape vines establish themselves. 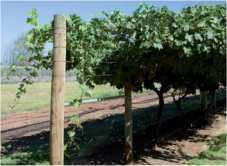 • How much sunlight do grape vines need? Plenty! Although you can probably get away with 5-6 hours of sunlight a day, 7-8 hours of sunlight is ideal. Plant your vines on a slope, facing south, to expose them to as much warmth and light as possible during the day. • How much water? After an initial dousing, grape vines don't require a lot of watering. In fact, constant high humidity can be a real danger. Your best bet? A drip irrigation system will not only ensure the proper amounts of water to your vines, but guard against powdery mildew and other fatal grape vine diseases that thrive in wet conditions. • Purchase root stock online or at your local garden center, and ask for advice on what type of vines grow best in your area. When ready to plant in the spring, set plants anywhere from 6-12 inches apart depending on the variety. • What kind of grapes should I grow? Good question. There are wine grape varieties that grow best in cool climates, some that can withstand high humidity, while others prefer warm summers and low humidity. In the US, check your local extension for wine growing resources and information for the best type of wine grapes to grow in your area. That said, red grapes are usually a good choice for the home vitner since the final product is a bit easier to produce than white wine. Surf the Web for more tips on creating a backyard vineyard, or get help from neighbors who are busy planting their own "taste of the grape." Who knows, in a few years you may be sipping a fine wine that was grown in your own backyard. The Vineyard Next Door - One man's personal chronicle with tips and advice for the home vineyard grower including a good collection of available resources, books and references.